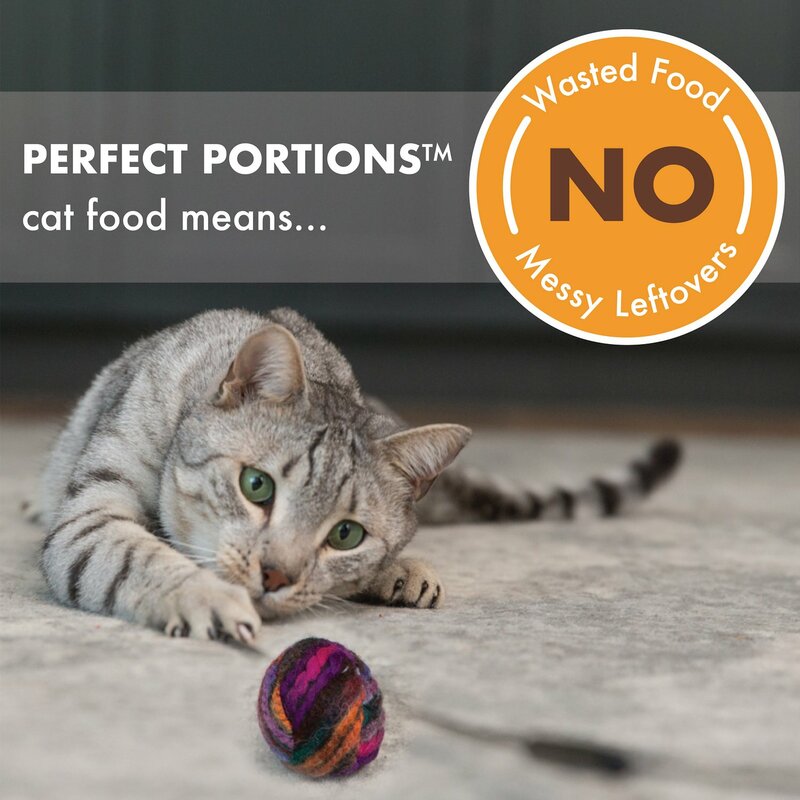 Your kitty goes wild for pate, so give him the nutrition he craves with the Nutro Perfect Portions Grain-Free Chicken Liver & Shrimp Recipe Cat Food Trays. 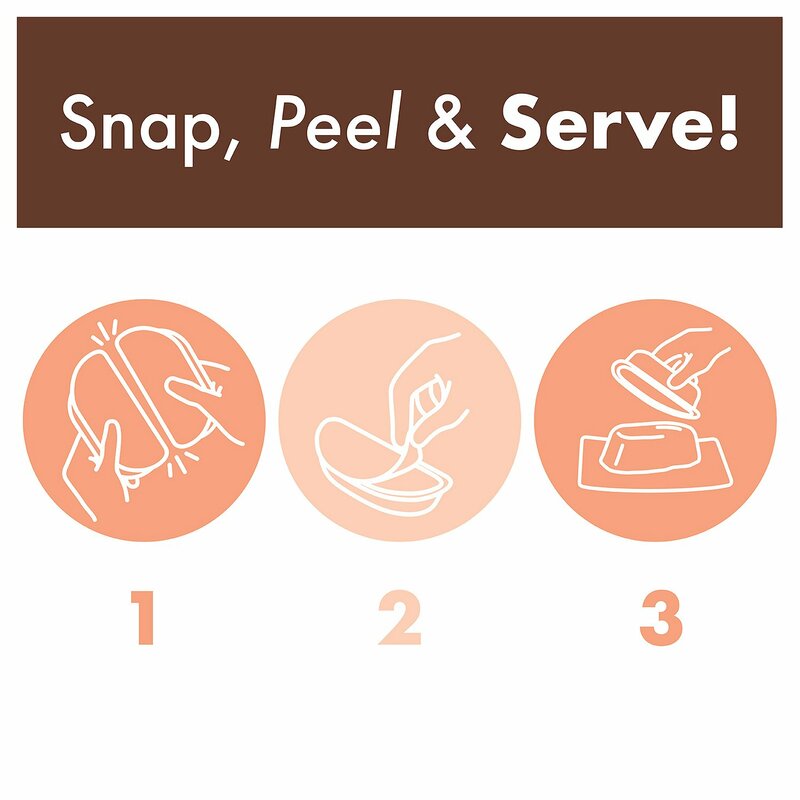 Featuring real chicken as the first ingredient in a whisker-licking juicy pate, it provides perfectly-portioned protein for healthy muscles and delicious flavor for a satisfied tummy. Every bite is also packed with all the nutrients your pal needs to look and feel his best every day, like vitamins, minerals and essential taurine. Plus, it also provides plenty of moisture to help keep him hydrated and healthy from nose to tail! And with no grains, fillers or anything artificial, even sensitive kitties can enjoy. Adult wet food trays feature real chicken as the first ingredient, plus shrimp for the protein needed to support healthy, lean muscles. 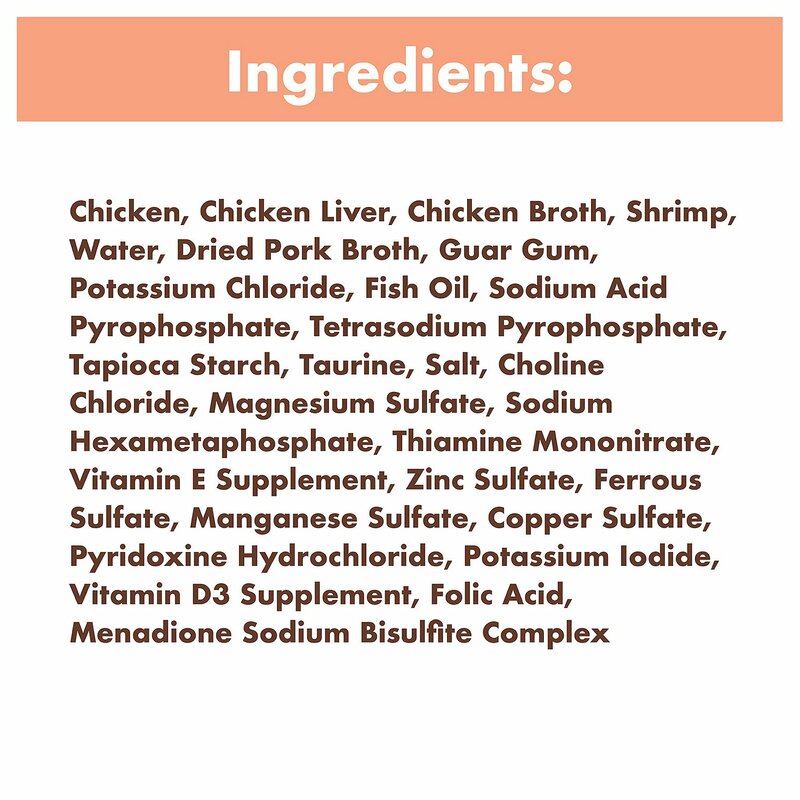 Chicken, Chicken Liver, Chicken Broth, Shrimp, Pork Broth, Natural Flavors, Guar Gum, Minerals (Potassium Chloride, Magnesium Sulfate, Zinc Sulfate, Iron Sulfate, Manganese Sulfate, Potassium Iodide, Copper Sulfate), Sodium Phosphate, Fish Oil (Preserved with Mixed Tocopherols), Vitamins (Choline Chloride, Thiamine Mononitrate [Vitamin B1], Vitamin E Supplement, Pyridoxine Hydrochloride [Vitamin B6], Vitamin D3 Supplement, Folic Acid, Menadione Sodium Bisulfite Complex [Source of Vitamin K Activity]), Salt, Taurine. If feeding NUTRO Cat Food for the first time or changing formulas, we suggest blending increasing amounts of the new formula with your old cat food for 6 days. 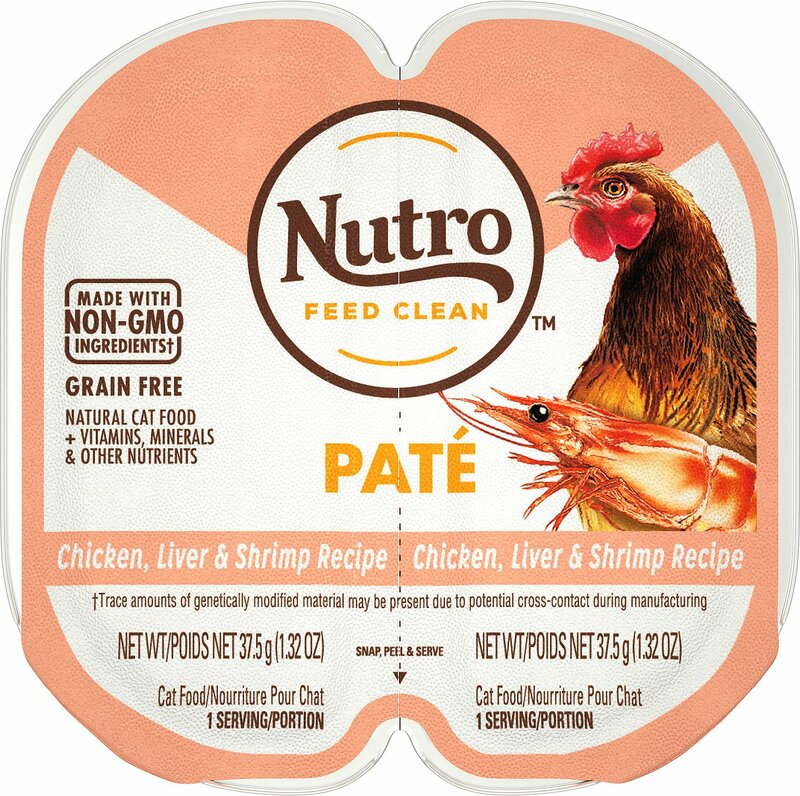 Does NUTRO Brand Dog and Cat Food contain artificial preservatives? No, our foods are naturally preserved with vitamin E. We never use chemicals like BHA, BHT, ethoxyquin, propyl gallate or sodium hexametaphosphate in NUTRO Natural Dog Food or Cat Food. Are any NUTRO Products currently being recalled? No, there are no recalls of any NUTRO Products in effect. 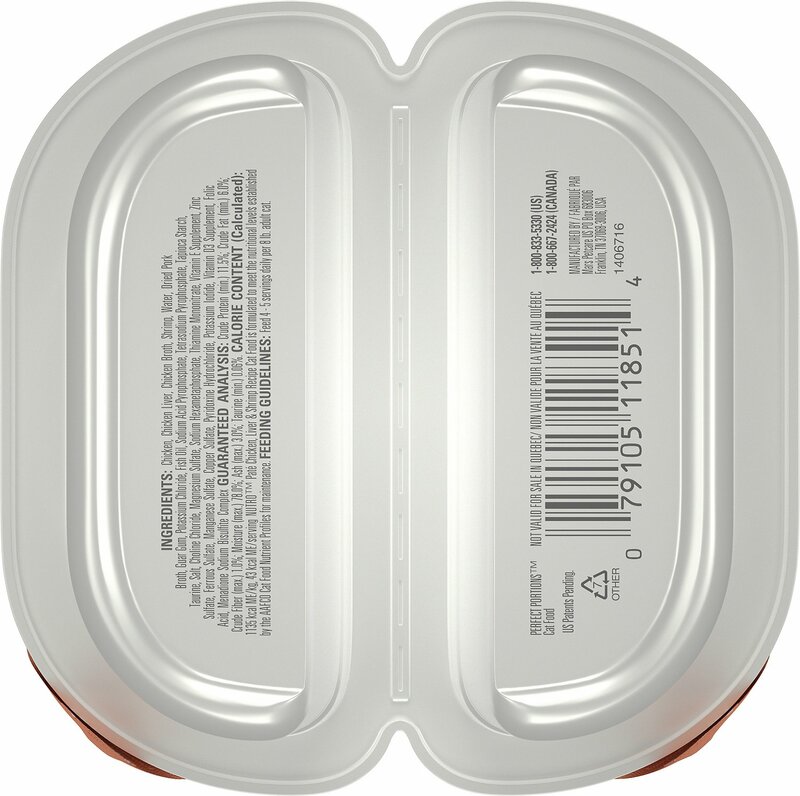 All NUTRO Products are safe and meet the highest standards of safety and quality. My three snarf this up! I have three adult cats. Nutro is one of the most highly rated cat food brands. I like the quality and my cats love the taste! The polish off every little schmear. If I could change one thing...the plastic is #7 and not recyclable in most municipalities. I would prefer cans. I am glad I decided to try Chewy.com. The site has a large variety of foods and products representing many different brands; the prices are very competitive; and the food I ordered arrived earlier than they said it would! Can't beat that! Thank you, Chewy.com! Glad to be a customer. Cats love this flavor. They lick their plates clean. 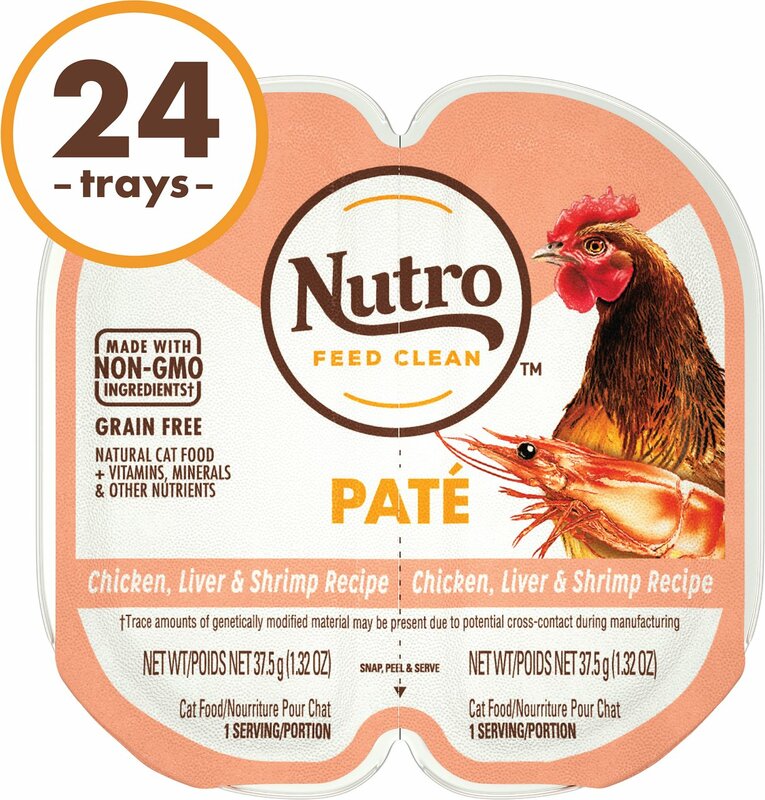 While I can't blame the Nutro, this is just another product that my cats don't seem to like. So, I'll keep trying. My kitty started to get finicky so I up'd the variety of this brand to give her more choices. So far so good! 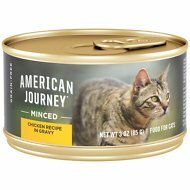 I gave my cat 5 different flavors, some with gravy and some pate. He walked away from everyone of them!!! Total failure. I have one diabetic cat who needs to be on a special diet which unfortunately meant the other two had to go on their own diet as well. They are very picky and I have gone through soooo much money trying to find something they will eat. I just put out their first serving and they are loving it so far! I am very happy.. my cat loves the food! I would order from here again and again. I’m very pleased. This is a really good company. Cat's cry out for it and won't touch the other stuff. Great buy. 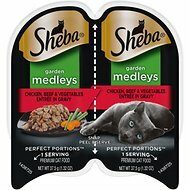 The cats love it, and the packaging allows for me to put half in each bowl without having to dirty a spoon twice a day.